This past summer, Spanish designer Angel Schlesser launched two new orange-based fragrances, Flor de Naranjo and Madero de Naranjo (Orange Blossom and Orange Wood). They join the Sélection de Mémoires series, which also includes Ambre Frais (2009) and Esprit de Gingembre (2007). Flor de Naranjo (shown) ~ "Orange Blossom opens with a top note of green citrus: bergamot accompanied by lemon, tangerine, orange and galbanum. This top note precedes a feminine middle note of orange blossom, enhanced by lily of the valley and rose petals. It blends into a seductive bottom note of cedar wood, oak moss, patchouli leaves, white musk and vanilla." Madero de Naranjo ~ "Orange Wood envelops us with a citrus-based top note: orange, lemon and tangerine. This is followed by a cool but spicy middle note thanks to green mint, fragrant star anise and minute petit grain. And a comfortable bottom note of orange wood, cedar and oak moss, combined with the sensuality of patchouli. 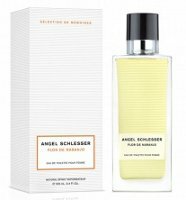 Angel Schlesser Flor de Naranjo and Madero de Naranjo are available in 50, 100 and 150 ml Eau de Toilette.